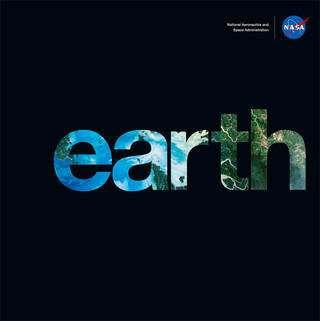 NASA studies Earth as part of its mission. Our satellites and instruments #PictureEarth daily. Some take visible light photos, much like your camera. Others peer into the infrared, microwave, ultraviolet, or radio spectrums, which human eyes cannot see. Each satellite image or data set reveals a small detail of the land, water, atmosphere, and life on Earth. Four global views illustrate how NASA satellites and instruments #PictureEarth daily. From left to right, average precipitable water vapor; monthly average sea level variation; average daytime air temperature; root zone soil moisture. Show NASA how you see your planet by posting photos on social media. Focus on the details around you with close-up images. What makes your location special? What are the textures, colors, or patterns in your surroundings? Look for Earth’s dynamism, motion, and beauty: blooming flowers, crashing waves, sturdy trees, furry and feathered animals, molten lava, puffy clouds, smooth ice, and warm sunlight. These photos of plants, animals, insects, and the atmosphere, land and water were taken by NASA employees and provide examples of how to #PictureEarth for Earth Day 2019. Share your best Earth photo! On Earth Day — April 22, 2019 — share your best photos of Earth on social media with the hashtag #PictureEarth. Be sure to tell us where your photo was taken. We love to read posts from around the world because NASA Earth data is available to everyone – we all live on this planet together. We’ll be watching on Instagram, Twitter, and our Facebook event page for your images and messages. 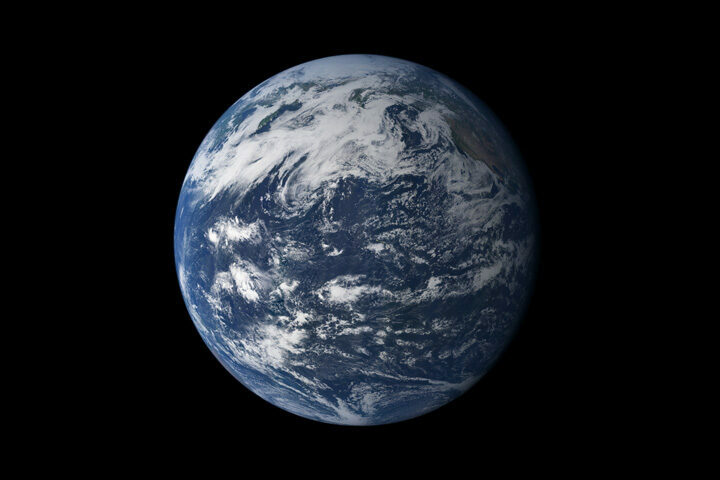 As with our previous Earth Day events, we’ll select some of the publicly-shared photos to showcase in videos and composite images featuring your beautiful imagery. On April 15, 1999, Landsat 7 first made its way into space. 106,380 orbits later, the 2.6 million images acquired by Landsat 7 have given us a fuller and more nuanced understanding of Earth. Landsat 7 data, together with data from its predecessor Landsat 5, provided the most comprehensive assessment ever of Earth’s mangroves in 2010. 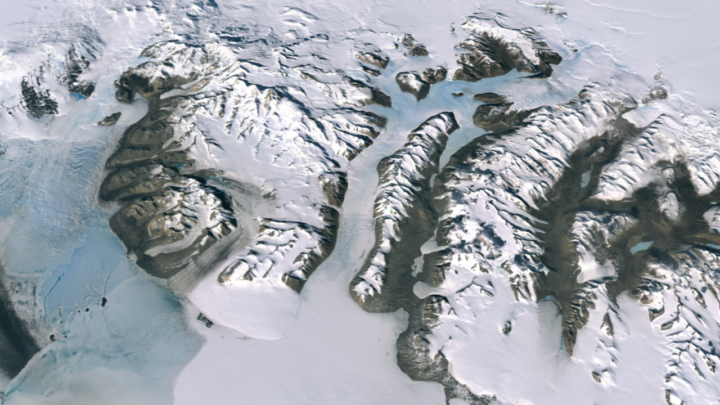 And for the International Polar Year (2007-2008), data from more than 1,000 Landsat 7 images were used to create the Landsat Image Mosaic of Antarctica (LIMA)—what was then the most detailed satellite mosaic of Antarctica. 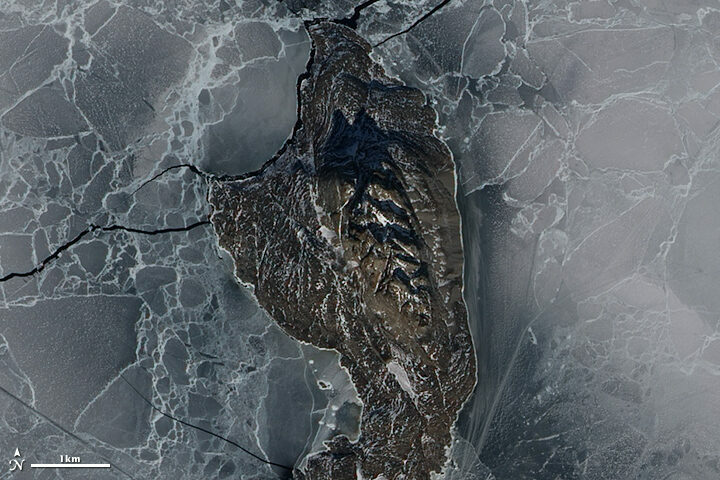 Here the LIMA data set shows Antarctica’s Ferrar Glacier (at 15 meters per pixel). If we travel two decades back in time and rewind the 4,733,375,587.686 kilometers that Landsat 7 has flown since April 1999, we arrive at a very different moment in spaced-based Earth observation. The commercially-owned Landsat 6 satellite had failed to reach orbit six years earlier. Landsat 5 was 12 years past its design life and operated by a for-profit entity that charged upwards of $4000 per image and collected international data only when there was an immediate customer. Both situations curtailed the systematic global coverage of Earth that had been envisioned by the Landsat Program’s founders. A building consensus about the critical role of Earth observation data for global change research had led the National Space Council to recommend that Landsat 7 be built. It should be operated by the U.S. government to ensure a continuous global archive of medium-resolution data for the long-term monitoring of Earth’s land surface. 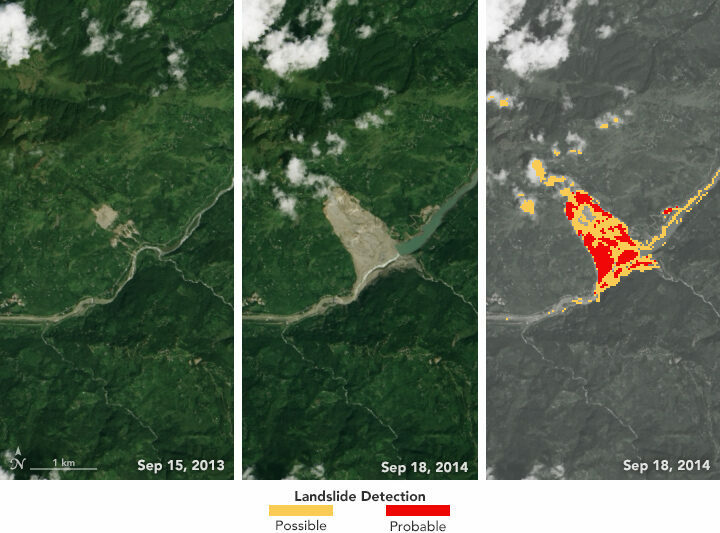 This was codified with the 1992 U.S. Land Remote Sensing Policy Act. When Landsat 7 launched on April 15, 1999, the Enhanced Thematic Mapper Plus (ETM+) instrument onboard was the most sophisticated Landsat sensor yet. ETM+ carried a new 15-meter panchromatic band and had a thermal band with a spatial resolution refined to 60 meters (compared to 120 meters for Landsat 4 and 5). It also carried a new solid-state data recorder—one of the first to fly on a civilian mission. For the first time in Landsat program history, Landsat 7 was equipped with hardware that could reliably store large amounts of imaged data onboard for later download when a ground station was in range. A natural color Landsat 7 image of the extensive coral reefs on the northern shore of Vanua Levu, Fiji’s second largest island (acquired on September 19, 2002). 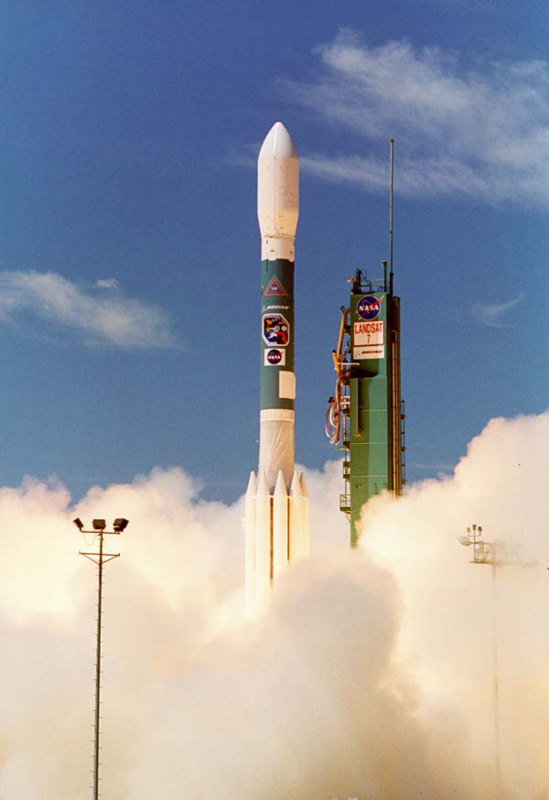 During its ascent into orbit in 1999, Landsat 7 collected data as it flew under Landsat 5. This enabled the cross-calibration of Landsats 5 and 7. (In 2013, Landsat 8 underflew Landsat 7 for the same reason). 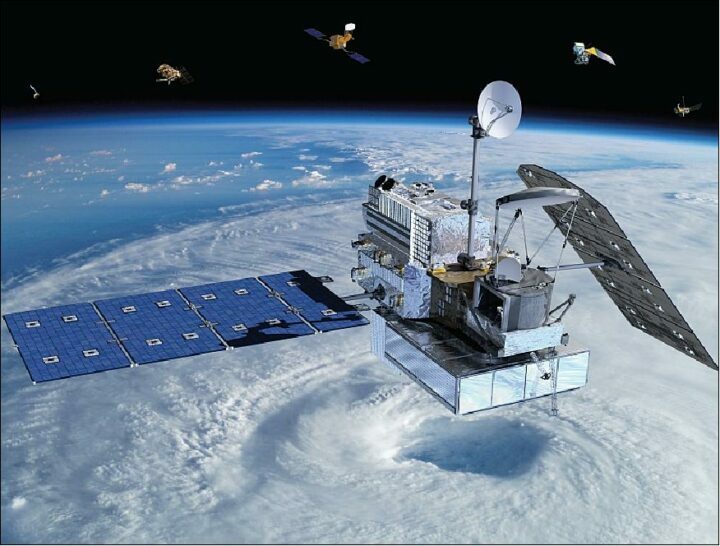 Additionally, a team of calibration scientists oversaw in-the-field calibration efforts, making certain that satellite measurements agree with physical ground measurements. Such careful data calibration ensures that the Landsat data record can show meaningful trends of land use and land cover change—even when the changes are subtle. Landsat 7 has enabled many firsts when it comes to global studies. The Giri et al. mangrove map is one such example. The landmark 2008 USGS decision to make all Landsat data free and open, and the subsequent trend towards best-pixel composite-based data analysis, has made these data gaps even less problematic. All in all, Landsat 7 has made remarkable contributions to global studies for two decades now, and according to fuel-based predictions, it should be able to continue doing so until the launch of Landsat 9. In the second it took you to read this line, Landsat 7 traveled about 7.499 kilometers. The launch of Landsat 7 was the second image ever posted on NASA Earth Observatory. The Landsat 7 Mission Operations Control Center is staffed by 14 engineers, seven days a week, 8 hours a day. Someone is always on call and ready to respond if a ground or spacecraft anomaly occurs. Goward, S.N. et al. (2017) Landsat’s Enduring Legacy: Pioneering Global Land Observations from Space. Bethesda, MD: American Society for Photogrammetry and Remote Sensing. Wulder, M.A. et al. (2019) “Current status of Landsat program, science, and applications.” Remote Sensing of Environment 225:127-147. Photo Credit: NASA/Jim Ross. Learn more about this image. When we published a few Landsat images of wildflower super blooms in California in March 2019, you may have had to squint a little to find the flowers. 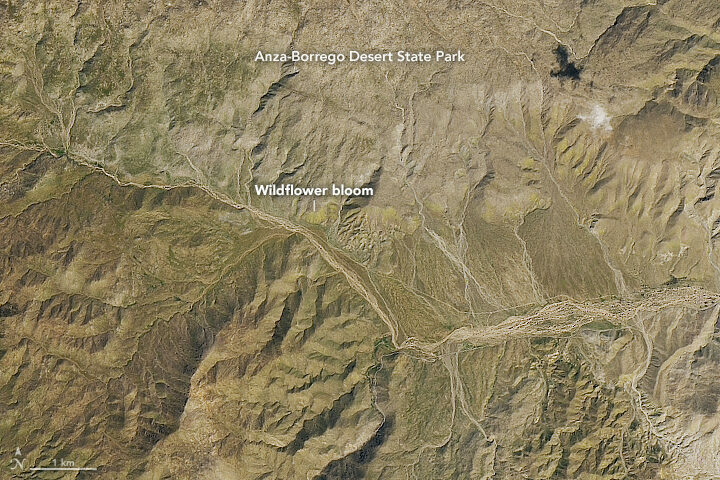 From 705 kilometers (438 miles) above Earth’s surface, at the 15-meter-per-pixel resolution of the Operational Land Imager on Landsat 8, the flowers tend to blend with the hues of the desert. 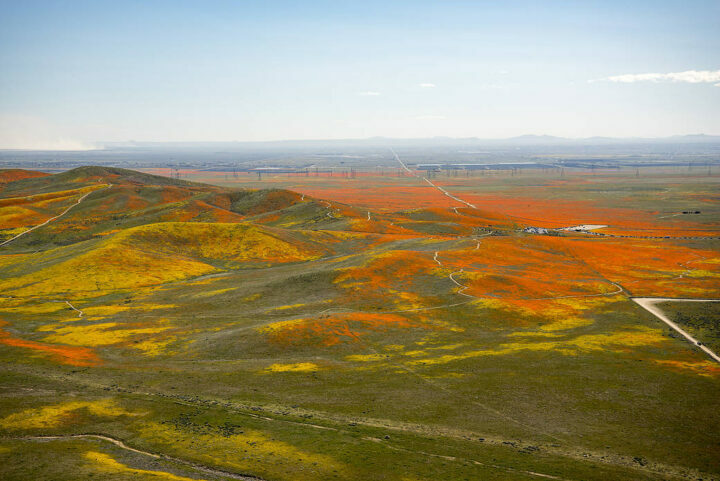 Not so with this colorful photograph of poppies and other wildflowers in Antelope Valley that was taken from a T-34 airplane. The picture was shot by NASA Armstrong aerial photographer Jim Ross, who may have one of the coolest jobs at NASA. Watch the video below to find out how he got it. Meanwhile, remote sensing scientist Iban Ameztoy was inspired enough by the aerial photos to pull Sentinel-2 satellite imagery of the same bloom and share them on Twitter. Want more satellite imagery and aerial photography of the super bloom in California? NASA Earth Observatory and NASA Armstrong have you covered. Photo Credit: NASA Earth Observatory/Landsat 8/OLI. Learn more about this image. Join a mosquito mapping blitz for Citizen Science Day through GLOBE Observer. Earth observations take place on many spatial scales. Some observations originate from sensors in space; others can happen with a mobile phone in the palm of your hand. GLOBE Observer is a free mobile app that connects an international network of citizen scientists with the broader scientific community in an effort to document and analyze changes taking place in Earth’s air, land, water, and life. The app is the centerpiece of a citizen science blitz now underway. Both globalization and a changing climate have caused countless living creatures to adjust their range and distribution. For human health, one of the most concerning impacts of a changing climate is the range expansion of mosquitoes. These flying vectors of disease are responsible for illness in millions of people; they also cause more than 700,000 deaths each year. Map of projected first appearance of mosquitoes, based on monthly minimum temperature data. Map data from Anthony Arguez, lmke Durre, Scott Applequist, Mike Squires, Russell Vose, Xungang Yin, and Rocky Bilotta (2010). NOAA’s U.S. Climate Normals (1981-2010). NOAA National Centers for Environmental Information. Courtesy Andrew Clark, IGES. 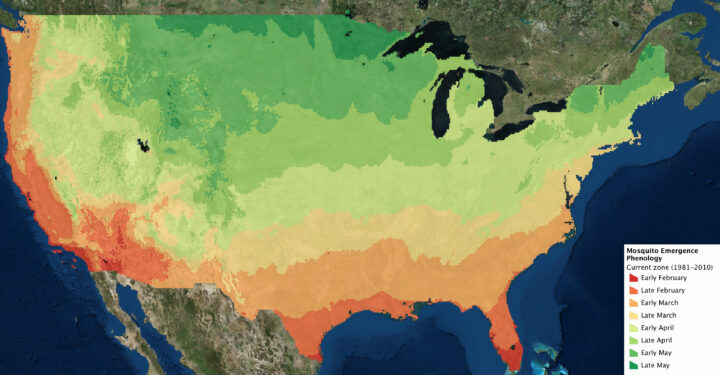 The northern hemisphere is now greening up in response to changes in sunlight and temperatures, and mosquito season is either just beginning or underway in much of the contiguous United States. The map above indicates when the first appearance of mosquitoes can be expected based on past weather data. The actual time of first appearance in a region can vary by several weeks, depending on the weather and other variables. 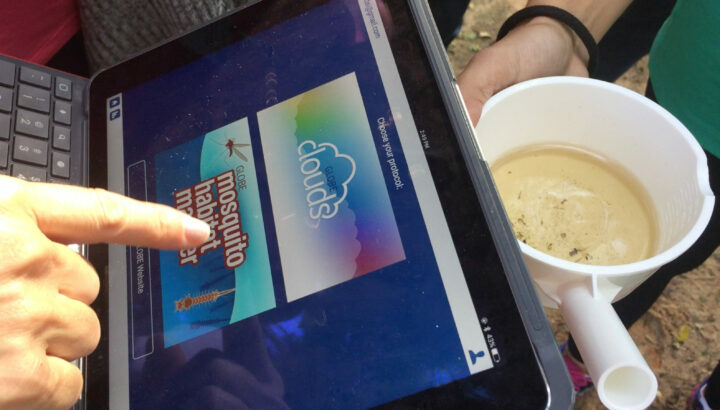 The GLOBE Observer app has a new tool known as the Mosquito Habitat Mapper, which makes it possible for citizen scientists to observe, record, and share data about mosquito breeding sites using a mobile phone. The data are important to scientists trying to predict disease outbreaks and epidemics. Observations provided by citizen scientists, combined with satellite observations and models, can make it possible to track the range and spread of invasive mosquitoes. With the Mosquito Habitat Mapper, citizen scientists can report active and potential breeding sites in their communities. And using a built-in taxonomic key, GLOBE Observers can help determine whether the mosquito larvae have the potential to transmit disease pathogens to humans. The GLOBE Observer app can help you identify the species of larvae. GLOBE Observers also can have an immediate impact on health in their community. In the last step of Mosquito Habitat Mapper, users report whether they were able to remove a breeding site. This can be accomplished in most cases by simply tipping and tossing standing water that is found in containers, or by covering stored water with a net or a lid. For larger water bodies such as ponds, irrigation ditches, or swamps, the reports about breeding sites can be used by mosquito surveillance agencies. In this way, GLOBE Observers are not only engaged scientifically, they can become agents of change in their community. The World Health Organization (WHO) identifies source reduction–the elimination of mosquito breeding sites–as the most effective way to protect human populations and reduce the threat of mosquito vector-borne disease. The GLOBE Observer Mosquito Blitz kicked off on April 7, 2019, and ends on Citizen Science Day (April 13). Join in this effort by downloading the app. Follow GLOBE Observer on social media during Mosquito Blitz week on Facebook or Twitter. Check out the Mosquito Blitz website and GLOBE Mission Mosquito for more mosquito resources. What do you get when you mix science with sugary marshmallow candy? Peepola Tesla, the candy bunny that invented the transmitter. Or Neanderpeeps, the group of sweet marshmallows that created fire. Or Dmitri Mendelpeep, the father of the peepiodic table. Of course here at NASA Earth Observatory, we are partial to the space- and Earth-themed dioramas. Take a peep at some of the entries below. Make sure to vote for your favorite here before April 14, 2019. Antarctic peep-searchers use Landsat images of peep-guin peep (er, poop) to measure the health of colonies. Penguin peep (er, poop) is bright pink and bright blue, depending on if they’re eating shrimp or sardines. What they’re eating and how much peep (er, poop) is on the ice is an important indicator of peep-guin health. 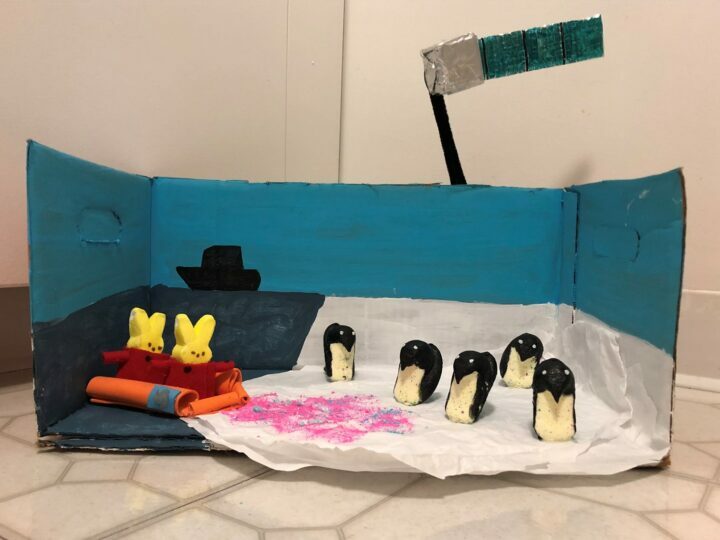 In this diorama, intrepid peep-searchers are bundled up in their cozy Arctic gear, visiting the peep-guin colony from a peep-search ship to ground-truth the colony counts they’re getting with satellite data. 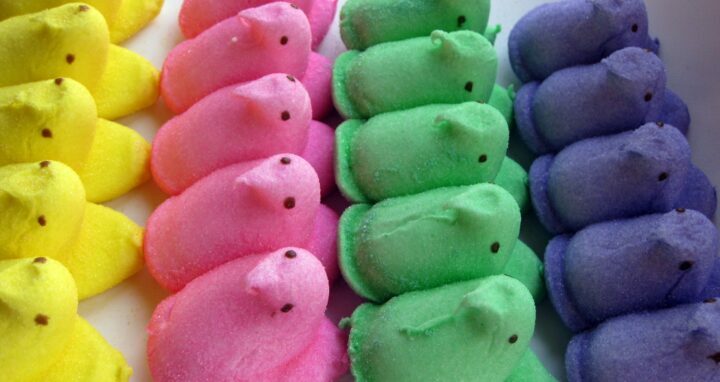 Reminder to all peep-searchers: Don’t eat the pink snow! Read about the original research on NASA Earth Observatory. 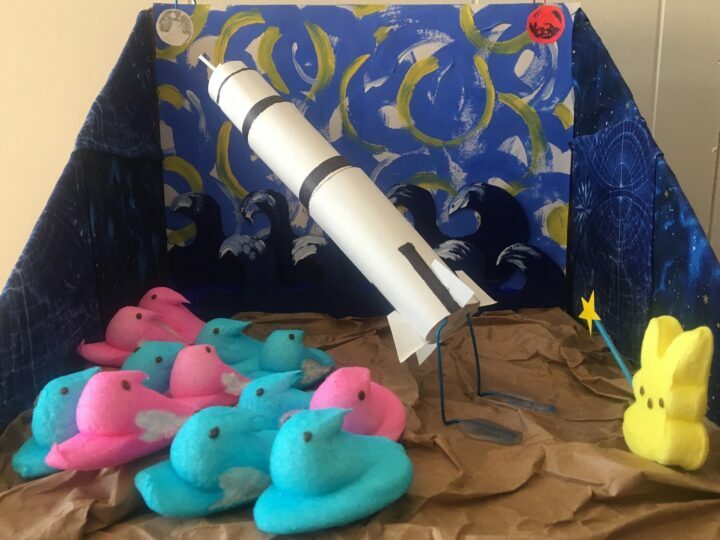 Peep scientists are investigating an unusual object at the far reaches of the solar system, known as Ultima Peep. 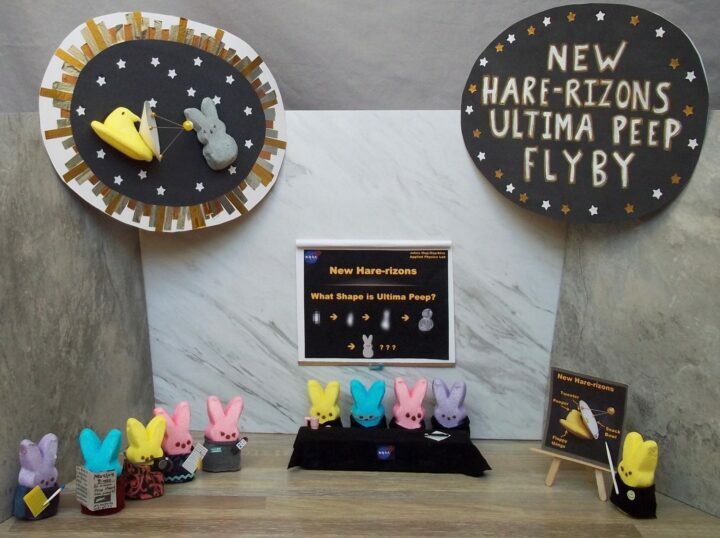 The spacecraft New Hare-rizons is closing in, and images of Ultima Peep are becoming clearer. At first, Ultima Peep appeared to be shaped like a bowling pin, but now, some are beginning to suspect that Ultima Peep is shaped like a peep. (Perhaps it is a lonely space peep?) The peeple demand information! Scientists have called a press conference to weigh in, and journalists are peepering them with questions. The scientific inspiration for this diorama is, of course, NASA’s New Horizons spacecraft and its investigation of the Kuiper Belt object Ultima Thule, the shape of which became clearer as the spacecraft got closer. Unfortunately, in our world, bunny ears never materialized. The diorama also includes a title and a close-up of the encounter between New Hare-rizons and Ultima Peep. Read about the Ultimate Thule flyby. 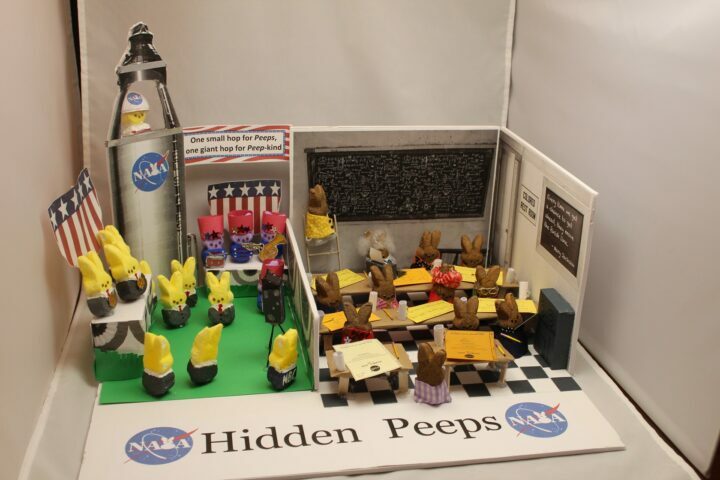 Hidden Peeps is an artistic rendering of the Black women who made essential contributions to the U.S. scientific space program at NASA. The right side of the diorama depicts the women, known as computers, whose work enabled US spaceflights but went largely unsung. The details include Dorothy Vaughan programming an early computer, Katherine Johnson and Mary Jackson writing their official technical reports, other women doing math on the chalkboard, calculating trajectories, verifying fight patterns. Be sure to check out the ‘colored’ bathroom sign (NASA’s facilities in Virginia were segregated), the Mary Jackson quote, the women’s glasses, typewriter, pencils, coffee mugs and family peeps photo. Learn more about NASA’s Hidden Figures and Modern Figures. 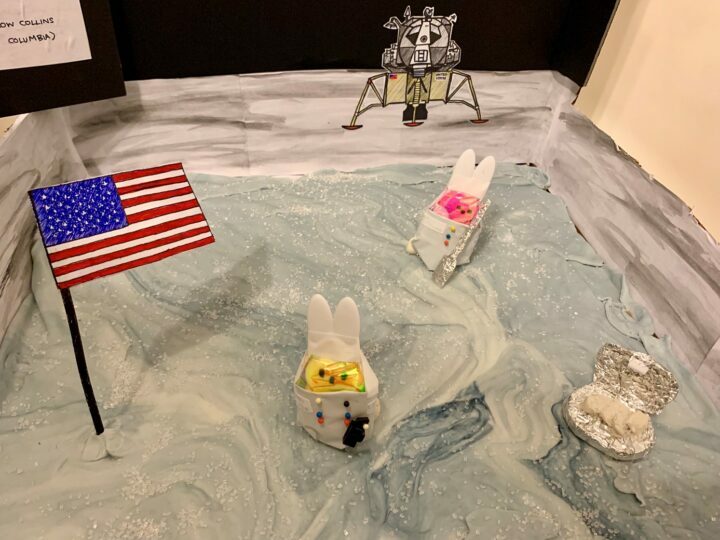 Astropeeps Bunny Aldrin and Neil Peepstrong explore Tranquilipeep Base — making history as the first sentient marshmallows to step on the moon. Marshmallow Collins drew the short straw and is orbiting up high in the Columbia capsule. See the photograph taken by Neil Armstrong of the Lunar Module at Tranquility Base. Peepil Armstrong takes his first hop on the moon. View the original video of Neil Armstrong walking on the moon. To The Moon? Nein! To Mars, My Peeps! Wernher Von Braun’s V2 rockets ultimately powered the Saturn V and took the United States to the moon, but von Braun always saw Mars as the true destination. Today, we are proving him right. So while the crowds have their eyes on the moon, von Braun points the way to Mars. Learn about NASA’s mission to Mars. The contest is hosted by The Open Notebook, a non-profit publication aimed to help science journalists sharpen their skills by providing useful tools, articles, and career advice. 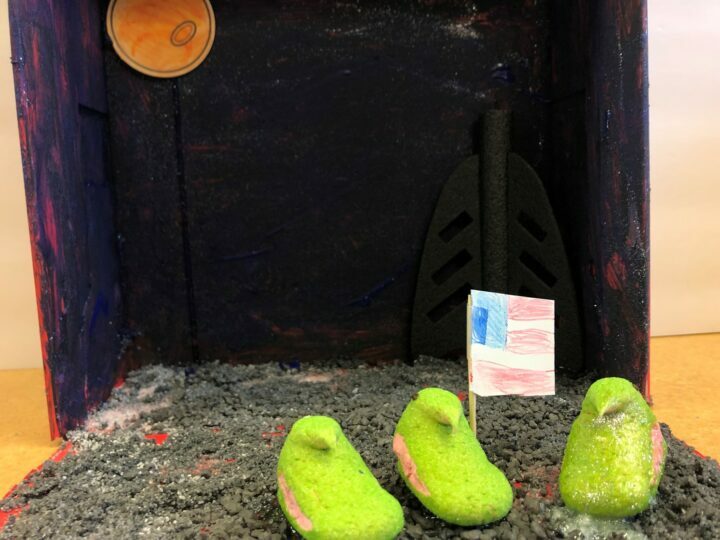 The contest is the brainchild of volunteers Joanna Church, Helen Fields, and Kate Ramsayer, an award-winning trio of peep diorama makers from the Washington, DC, area. 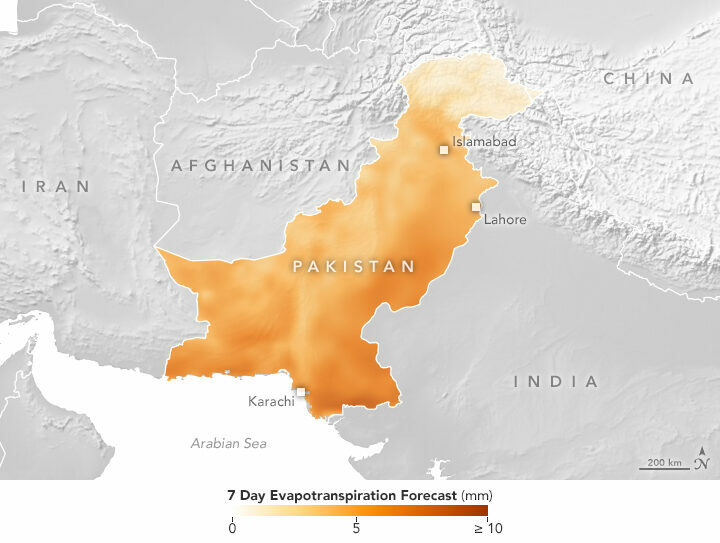 Credit: NASA Earth Observatory, from the Water Cycle fact sheet. From afar, Earth’s oceans look quite blue. But closer inspection reveals a much more complex palette. Tiny particles floating in the water (phytoplankton, pollution, and sediments) can change how light is absorbed and scattered, which affects the apparent color of the water near its surface. Color is useful for scientists who model how the oceans might evolve with time and climate change. “It’s cool to see how all of these global Earth models—completely different when it comes to their complexity—use the color of the ocean to explain the changes in the future,” said Ivona Cetinic, an ocean ecologist at NASA’s Goddard Space Flight Center. In one example, NASA-funded researchers showed large areas of the planet’s blue water becoming even bluer. The change would come from a decline in green-pigmented phytoplankton as the planet warms. You can read more about that study in Nature Communications, or check out some of the media coverage. The Operational Land Imager (OLI) on the Landsat 8 satellite acquired this image of the Mackenzie Delta on July 19, 2017. Read more about the image here. In a different study published in Geophysical Research Letters (GRL), researchers from NASA Goddard found that the “yellowing” of coastal waters could lead to cooler global ocean temperatures. 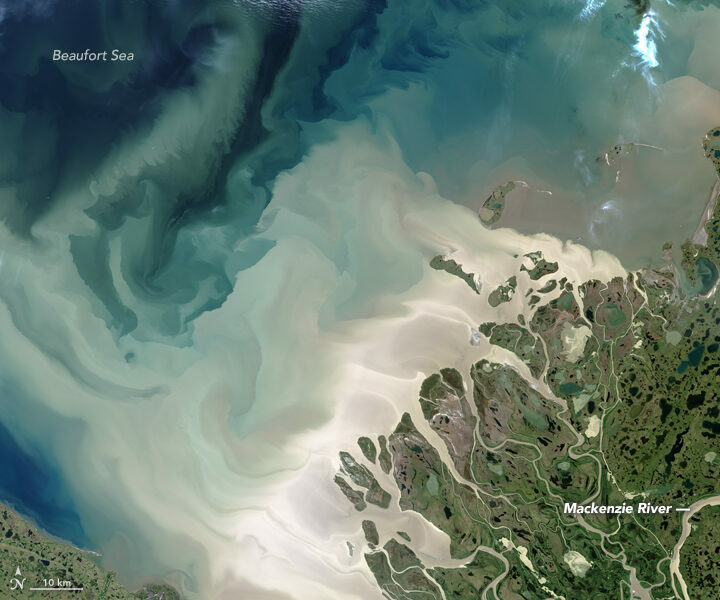 Yellow-brown waters already show up around some coastal areas where rivers meet the ocean—such as the outwash from the Mackenzie River in northern Canada (above). Pulses of water from the spring melt move a huge amount of dissolved organic material and sediment into the Beaufort Sea. Coastal waters could become yellower over time if increases in precipitation and melting on land wash more dissolved organic material out to the ocean. The researchers ran simulations that incorporated NASA ocean-color data and showed that after 300 years, the top 700 meters of a “yellow” ocean with dissolved organic material and plankton would be colder than a “green” phytoplankton-only ocean. That’s because yellow water lets less light and heat pass through the top layer of water, keeping it cooler below. 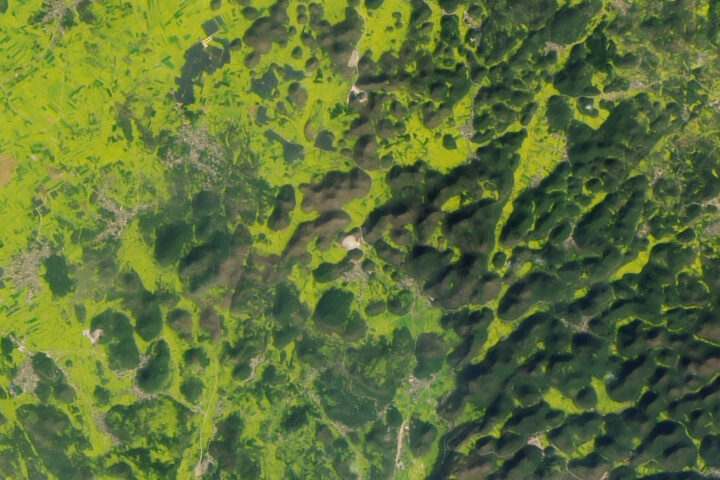 Every month on Earth Matters, we offer a puzzling satellite image. The March 2019 puzzler is above. Your challenge is to use the comments section to tell us what we are looking at and why it is interesting. On February 27, 2014, a Japanese rocket launched NASA’s latest satellite to advance how scientists study raindrops from space. The satellite, the Global Precipitation Measurement (GPM) Core Observatory, paints a picture of global precipitation every 30 minutes, with help from its other international satellite partners. It has provided innumerable insights into Earth’s precipitation patterns, severe storms, and into the rain and snow particles within clouds. It has also helped farmers trying to increase crop yields, and aided researchers predicting the spread of fires. The Grand Canyon in northern Arizona has a long history. Between 5-6 million years ago, the Colorado River started carving through a high, flat plateau. About 12,000 years ago, people in the vicinity of the canyon left behind the area’s oldest known human artifacts. 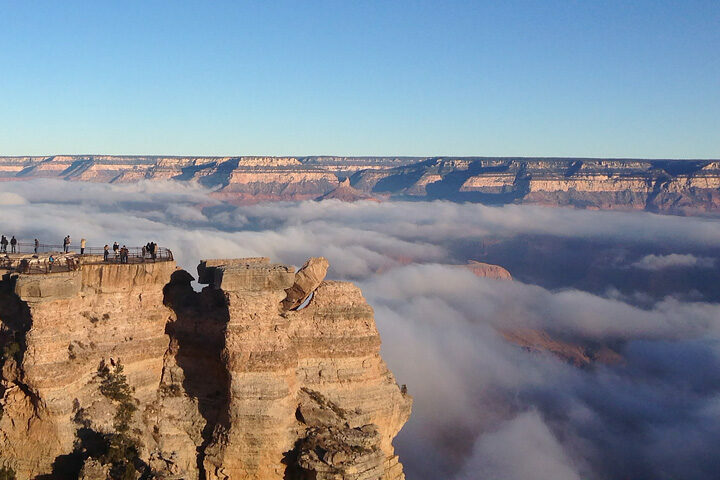 One-hundred years ago, a signature by President Woodrow Wilson established the Grand Canyon as a National Park. 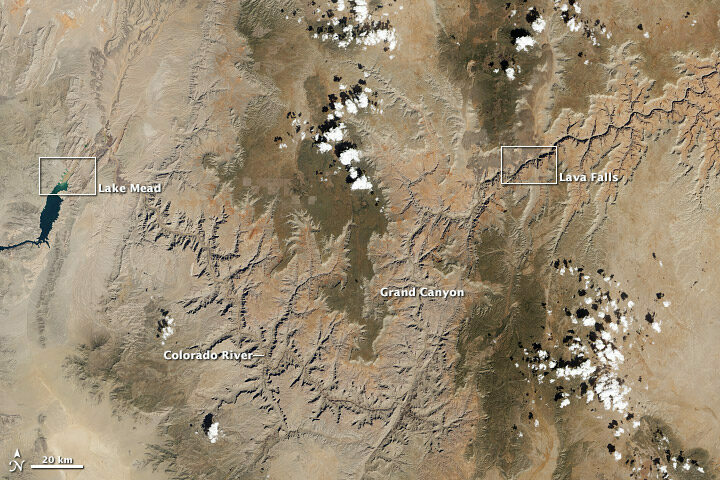 NASA Earth Observatory has existed for just one-fifth the time of Grand Canyon National Park. But over those 20 years, satellites and astronauts have captured some magnificent views of the park from above. Here are some of our favorites. 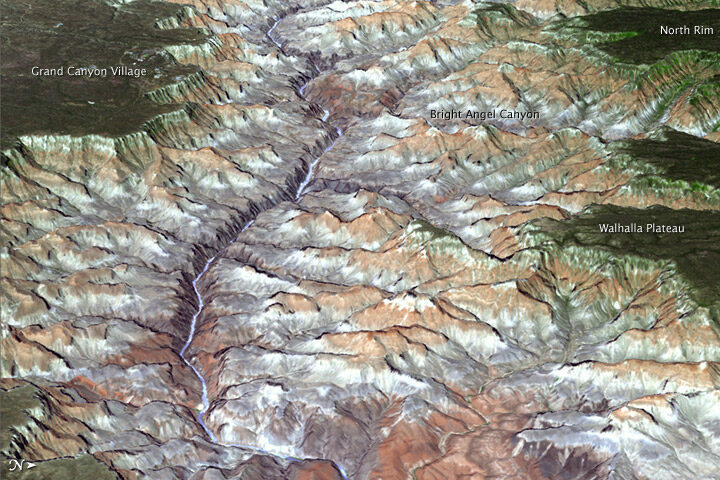 The top image, shot by an astronaut from the International Space Station (ISS), shows the canyon in winter 2009, when snow blanketed part of the plateau. 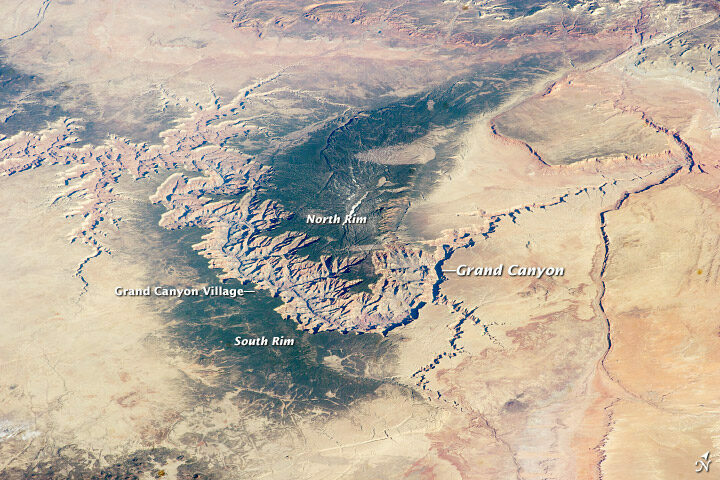 The second image, also shot from the ISS, shows the canyon in spring 2014. 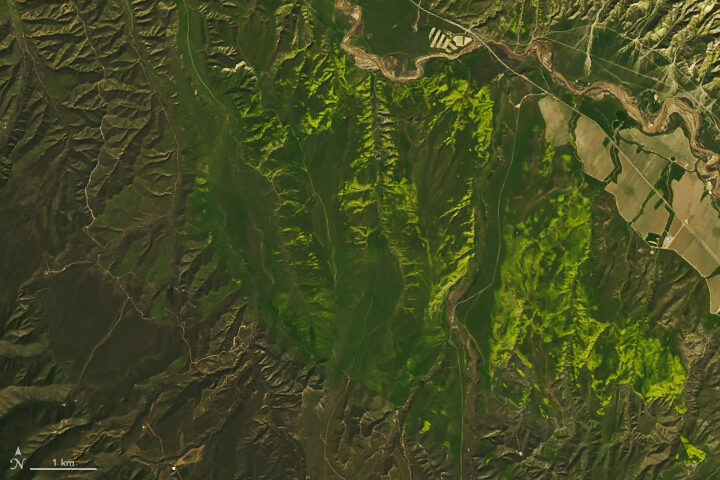 Satellites usually offer nadir (straight-down) views of the canyon, such as these natural color images acquired with the Landsat 8 satellite in April 2013. 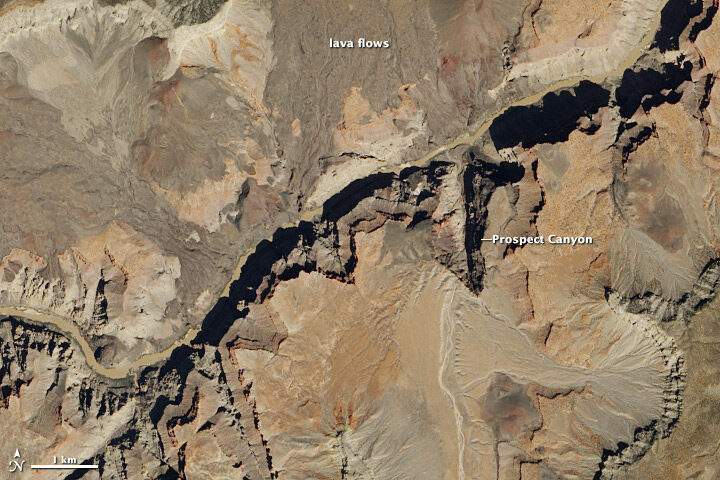 The wide view shows the canyon in context with the surrounding plateau, while the detailed image shows an area around the rapids known as Lava Falls (in reference to old lava flows in the area). In its 100 years as a National Park, the canyon still turns up surprises to visitors and Park Service rangers. 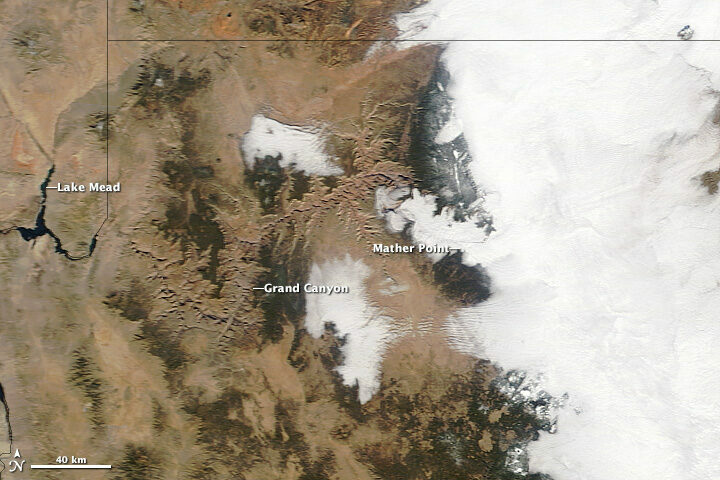 These images show a rare weather event in December 2013 that filled the canyon with an ocean of clouds. Three-dimensional views are also possible from space. An improved version of a digital topographic map of Earth released in October 2011 made it possible to produce this 3D view of the eastern part of the Grand Canyon. 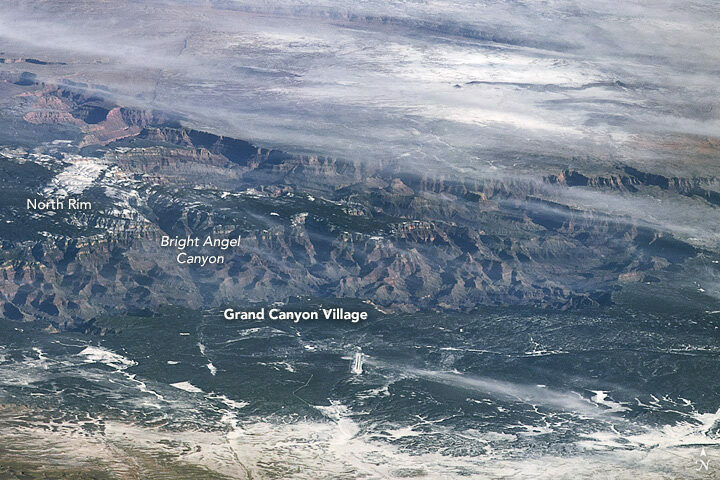 You can view more Earth Observatory images of the Grand Canyon here. And if you find yourself in Arizona, here is list of centennial events hosted by the National Park Service throughout the year. 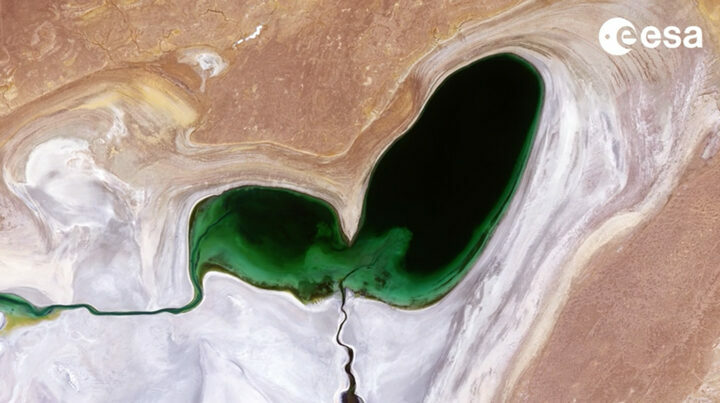 When you look at Earth from above as often as we do, you become intimately familiar with the shapes and patterns that can emerge across the planet. Some are made by people and others by nature. Some are ephemeral and others more permanent. Today we took a light-hearted approach to the Image of the Day, explaining the science behind one such shape—what appears to be a Valentine in the Sky. 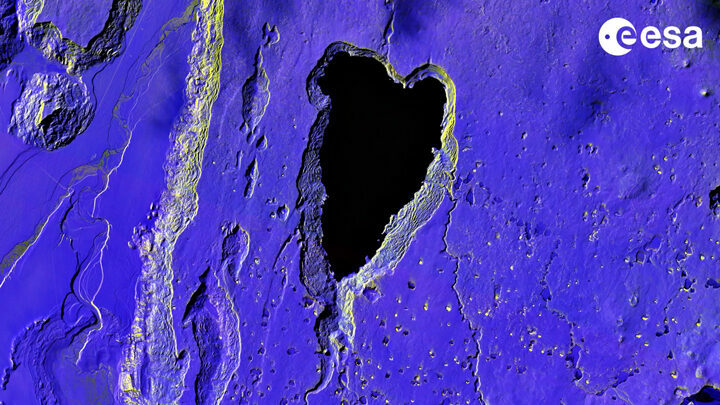 The image prompted us to look and see where other heart-shaped features have turned up. 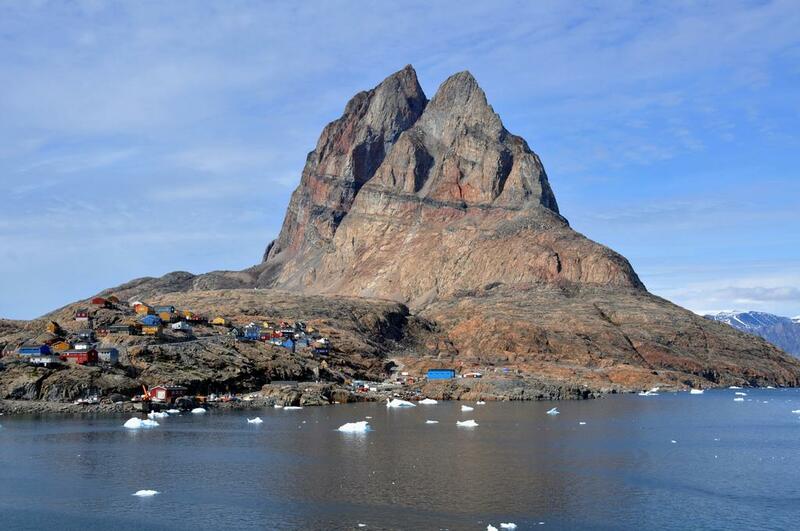 It is no mystery how Uummannaq Island got its name. In Greenlandic, the word means “heart-shaped,” an apt description for the multi-peaked mountain that towers over the 12 square kilometer (5 square mile) island. Located in Uummannaq Fjord off the coast of northwestern Greenland, the granite and gneiss peak rises sharply from sea level to 1,170 meters (3,840 feet). Read more. Stand next to these lakes carved out of the sand in Dubai, and their shape might not be immediately obvious. 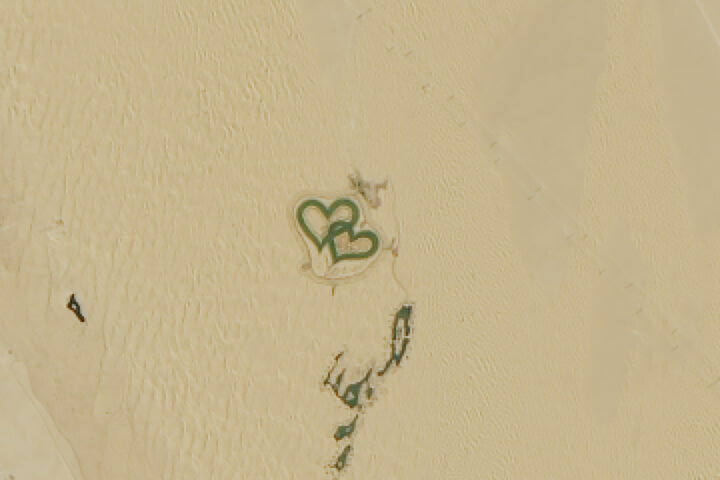 But viewed from above—and even from space as shown in this Landsat image—the intertwined heart-shaped lakes contrast sharply with the Bab Al Shams Desert. Read more. 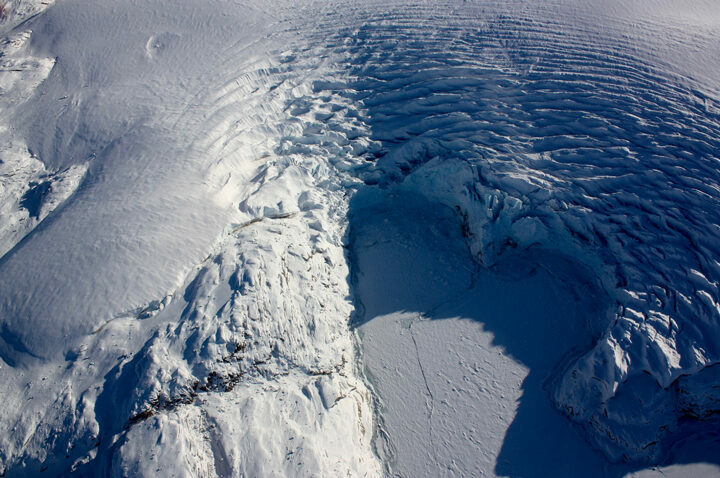 This heart-shaped calving front of a glacier in northwest Greenland was photographed by Maria-Jose Viñas during a flight of NASA’s Operation IceBridge mission on Mar. 27, 2017. It later became a backdrop for a printable Valentine. See more NASA Valentines. 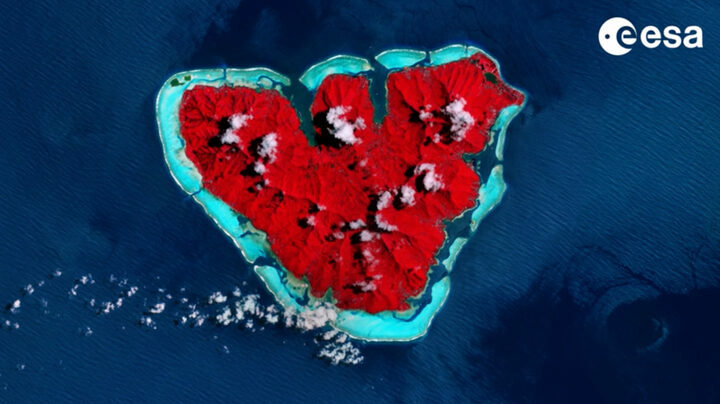 Moorea is a heart-shaped island in the South Pacific, about 20 kilometers northwest of Tahiti. Read more. The Aral Sea has been shrinking for decades, and just a fraction of its water remains. This image shows the heart-shaped lobe of the sea’s western half in August 2018. Read more. Lake Strobel, located in a remote part of the Patagonian steppe in Argentina, supports some of the world’s largest rainbow trout. Read more.